Hyoid suspension surgery was especially developed to cure obstructive sleep apnea and it's effective in patients with hypopharyngeal obstruction, where the lateral pharyngeal wall and base of tongue collapse, blocking the airway. So, the idea is to prevent the collapse of the tongue musculature, which relaxes during sleep. This procedure advances the tongue base and epiglottis forward, by advancing the hyoid bone, thereby, opening the breathing passage at this level. The surgery has started in 1986, when based on the radiocephalometric studies, the scientists discovered that the hyoid bone is positioned lower than in healthy subjects. The surgery is done through a small incision in the upper neck. By detaching two tendons on the hyoid bone and some of the muscle on the lower surface, the hyoid can be advanced and secured in position. respiratory distress - it may happen to patients with severe sleep apnea, where it was required to use CPAP preoperatively. To prevent this side effect, is a good idea to continue the CPAP respiration during postoperative phase. the efficacy data for isolated hyoid advancement are rare. 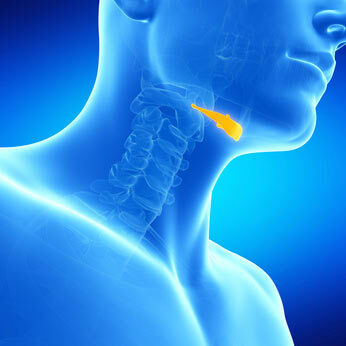 Nonetheless, according to some studies, the total success rate for isolated hyoid advancement surgerie lies slightly below 50%, and much lower in patients with severe obstructive sleep apnea. This study shows 17% success rate for this procedure, which is very low. However, the success rates for multilevel surgery (UPPP, tongue reduction, mandibular advancement) where hyoid advancement is included, is approximately 75%, which is encouraging (only for mild to moderate obstructive apnea patients). Unfortunately, for patients with severe sleep apnea, the success rates start to decline to 42%. the AHI value has to be lower than 20 after the procedure.